Who benefits from the Hands to Hand Community Fund? Those in our community that need and depend on the programs and services our member agencies provide. You’re likely to find more than one of our member agencies has played a role in your life or the lives of someone you know. they serve need your help more than ever before. The Arc exists to serve adults and children with intellectual and developmental disabilities by providing a variety of programs and services. These programs include: a Day Hab for adults, social activities for teens and adults, summer camps for all ages, employment services, a self-advocacy group, a teen after-school transition program, and an integrated child care program for children with and without disabilities. 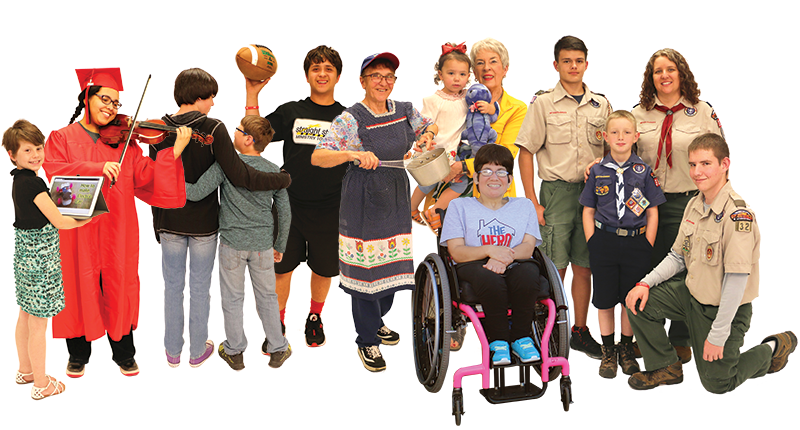 Northwest Texas Council, Boy Scouts of America serves 1,100 young people who participate annually in programs focusing on character, education, leadership training, plus Scouting’s signature outdoor classroom – Camping. The skills young men and women develop in the great outdoors are some of the most important in their lives. Scouting transforms impressionable youth into caring, responsible adults. Youth ages 5-18 benefit from programs provided by the Boys & Girls Club of Burkburnett. In addition to sports leagues, the club provides an After School-Program and Summer Camp to the youth of Burkburnett and the surrounding community including SAFB. Members receive transportation from all Burkburnett ISD Schools, daily hot meals through Kids Café, homework assistance, and many more programs to create leaders for tomorrow. The Children’s Home and Teen Shelter provide basic care and emergency shelter for abused, neglected, runaway and homeless youth 17 months to 17 years of age in North Texas serving an 11 county region. All youth are provided shelter, case management, supervision, food, clothing, counseling, daily living skills training, tutoring, and referrals for medical/psychological counseling services. All children are provided basic care items such as clothing, grooming needs, toys, books, and school supplies. Most importantly, they provide a safe place for these children to live. The Friendly Door provides multiple services and many fellowship opportunities in a faith based atmosphere that allow seniors an excellent way to stay active and involved in their community. Our mission is to make a difference in the fight to end senior hunger by making sure no senior goes hungry in the Iowa Park Community. Every aspect of the center is designed to insure our clients remain independent longer with the best quality of life possible. The mission and purpose of Straight Street is to provide a SAFE Christian environment where “at-risk” youth can obtain the necessary skills and training needed to mature and discover God’s divine plan for their lives. For our purposes, an “at-risk” youth is a young person between the ages of 11 and 18 years old who is behaving in such a way that if a caring adult does not step into their life with some help, there is a high likelihood they will hurt themselves or someone else.